Are you interested in what I’m reading that’s not for fun over the next two days? 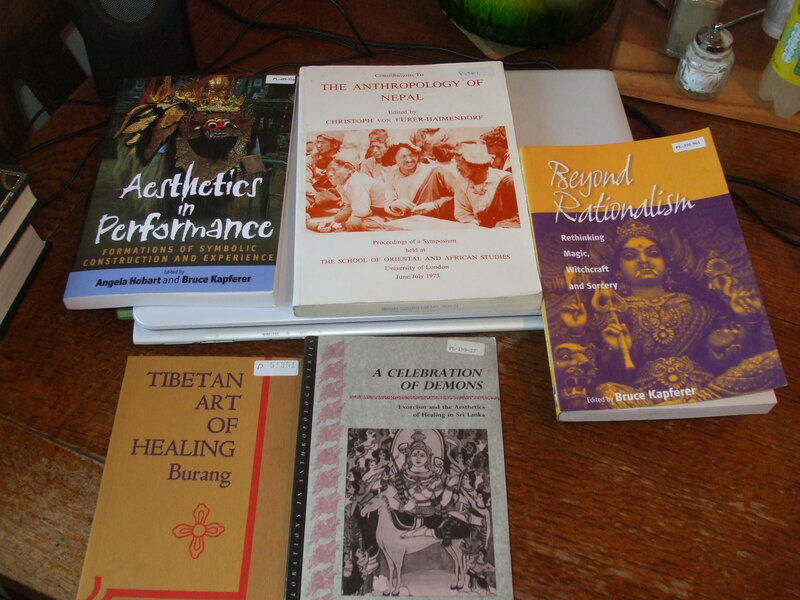 That’s Burang’s Tibetan Art of Healing, Kapferer’s A Celebration of Demons, Kapferer’s edited volume Beyond Rationalism, Hobart and Kapferer (ed.s), Aesthetics in Performance, and Christoph von Fürer-Haimendorf’s edited Contributions to The Anthropology of Nepal. Yes, I’m an ancient historian in research interests. Why am I reading modern anthropology of Nepal? This entry was posted in glamour, history and tagged books, reading. Bookmark the permalink. Honestly, a lot of those look interesting to me. But a lot of things look more interesting when I can read them at my leisure, rather than needing to get them read in time for doing a thing. This is why I will be sad that I have to power through them and not savour all the interesting bits. The reasons are the same ones that caused me to read a ton of modern anthro while writing a diss on Venetian Renaissance painting. They are good reasons. None of those books loved me. Alas.